20 • RV PRO • April 2019 rv-pro.com R V M A N U F A C T U R E R S W hen industry veteran Scott Degnan was tapped in June 2016 to head Winnebago Towables, he was given a clear mandate: Make Winnebago relevant in the towables market. It was no easy task. Winnebago entered the towables segment in late 2010 with the purchase of Sunnybrook RV, a small but established and respected player. Still, the new acquisition floundered some- what in the immediate post-Great Recession period, never breaking a 1 percent market share in the towables market and never measuring up to the company's expectations – even as the larger towables market was experiencing strong, sustained year-over-year growth. Degnan glumly describes the Winnebago Towables divi- sion as "almost non-existent" during those trying times prior to his arrival. However, Winnebago Towables is changing that narra- tive today. In a Dec. 19, 2018, conference call with Wall Street inves- tors, Winnebago CEO Michael Happe praised the Winnebago Towables Division and Degnan, who serves as its vice president and general manager. 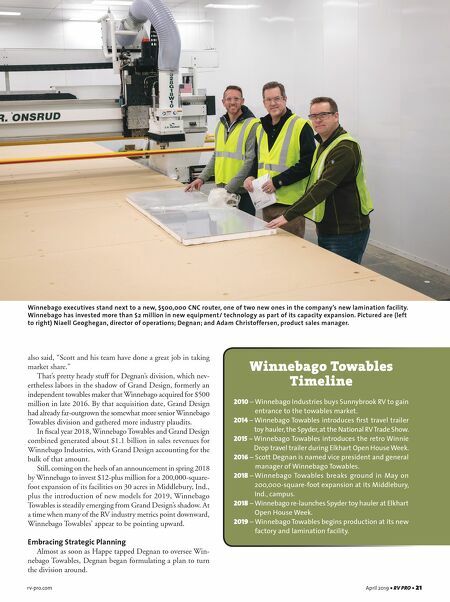 Happe said that he is "pleased inordinately with the Win- nebago Towables progress – especially in the last two years." He With a $12 million expansion for its manufacturing facility in Indiana and some recent product launches in the toy hauler and fifth wheel categories, the towables division has high hopes for 2019. PHOTOS BY STEVE TOEPP/ MIDWEST PHOTOGRAPHICS Winnebago Towables Division Vice President and General Manager Scott Degnan was tapped to head the division in June 2016 with a clear mandate: Make Winnebago relevant in the towables market. Winnebago Towables is growing its market share thanks in part to a revamped, expanded product line. 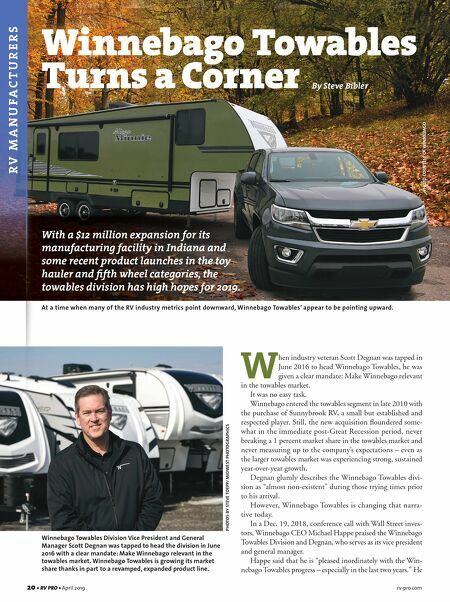 Winnebago Towables Turns a Corner By Steve Bibler PHOTO COURTESY OF WINNEBAGO At a time when many of the RV industry metrics point downward, Winnebago Towables' appear to be pointing upward.